What is Thin Computing and Zero Client Computing? Thin Computing delivers the productivity people need, at a lower cost than traditional methods, all without compromising security or manageability. Thin Computing replaces the PC with a Thin or Zero Client, making it easier for IT to manage user desktops by moving their complexity to the datacenter. Analysts agree that this approach improves the reliability and security of information, dramatically lowers IT costs, reduces energy consumption, and is far better for the environment. Yet Thin Computing still provides the access to applications and data that people need in order to move the business forward. All while improving on the security, reliability, and availability of PCs. People often make the mistake of thinking that Thin Computing is just another name for thin-client computing. Actually, Thin Computing includes hardware services and software that work with Thin Clients, Zero Clients, and PCs, as well as wireless devices and other systems. It gives everybody in the organization secure access to the information and the applications they need, without requiring the desktop systems to store them. Why Thin Computing and Why Now ? Today, as much as 80 percent of IT's budget is allocated to maintenance, making it very hard for any IT organization to add value to the business. Chief Information Officers have seen their titles evolve to Chief Infrastructure Officer, as they are totally consumed by the need to avoid regulatory problems and keep things running at the same time. Thin Computing not only reduces the cost to deliver desktop computing by as much as 40 percent or more, it also frees IT staff time to focus on more strategic initiatives. Additionally, the increased availability of high-bandwidth network connections and the sophistication of datacenter architectures based on Microsoft Windows Terminal Services, Citrix Application Delivery, or VMware Virtual Desktop Infrastructure, allow Thin Computing solutions to run at desktop speeds, and display rich multimedia like never before. This makes it easier and more acceptable for business professionals to use Thin Clients in mission-critical applications. The majority of today’s thin clients have a small OS in them that provides the functionality to securely connect to servers and display applications for workers. The small amount of software in these devices is why they’re called “thin” clients. Enterprises have successfully adopted this technology in the millions of units, and for some, there is an opportunity to make the desktop or mobile device even thinner – called a Zero Client. A Zero Client has no local OS pre-installed on the unit. This information is provisioned to the desktop (like a cell phone is provisioned when purchased) when it is powered up, based on the worker’s role in the organization. Zero Clients cost less, and don’t need to be managed, but require more network bandwidth than Thin Clients. 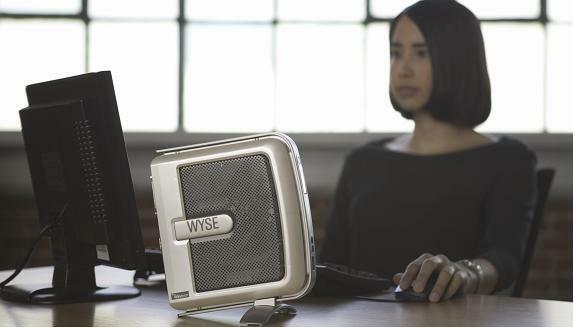 Wyse is the worldwide leader in Thin Computing, offering Thin and Zero Clients before anyone else. 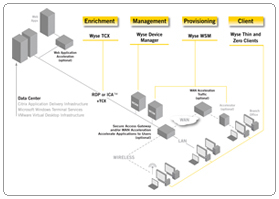 Wyse software makes it easy to provision, manage, update, and even service any Thin or Zero Client from one central location. After all, it's much easier and more cost-effective to manage several servers than thousands of individual desktop PCs. And with no moving parts thanks to solid-state technology, Wyse Thin and Zero Clients deliver greater reliability, availability, and lower cost of ownership than other solutions. Want to Calculate your ROI (Return On Investment)? The Wyse ExpertROI Analyst™ Tool was developed independently by leading IT research firm IDC, and leading ROI tool developer Alinean, Inc. This analysis tool examines current client computing opportunities and quantifies potential advantages for Wyse managed thin client solutions. For further information regarding the ROI tool please contact us. Going forward, the world is only going to get thinner. The Wyse Guys are Australia's Premier Supplier and are already assisting many Australian companies rapidly moving in this direction.